Smolich » Roger Perron Inc.
Paul and I wish to express our sincere gratitude for your services related to the remodeling of our home. Our recently completed second project, the master bedroom and bathroom, hallway and guest room, came out great and we are thoroughly enjoying it. 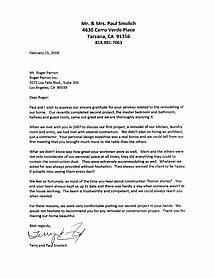 When we met with you in 2007 to discuss our first project, a remodel of our kitchen, laundry room and entry, we had met with several contractors. We didn’t plan on hiring an architect, just a contractor. Your personal design expertise was a real bonus and we could tell from our first meeting that you brought much more to the table than the others. We feel so fortunate, as most of the time you hear about construction "horror stories". You and your team always kept us up to date and there was hardly a day when someone wasn’t at the house working. The team is trustworthy and competent, and we could always reach you when needed. For these reasons, we were very comfortable putting our second project in your hands. We would not hesitate to recommend you for any remodel or construction project. Thank you for making our home beautiful.